Clovis Oncology, Inc. (NASDAQ: CLVS) of Boulder, Colorado made a $200 million bet on lucitanib, at least in upfront money and stock. Last week it agreed to buy the Italian biopharmaceutical company EOS (Ethical Oncology Science) S.p.A., which is at work developing a novel targeted therapy to treat cancer. The real target was EOS’ global rights (excluding China) to develop and commercialize lucitanib, a mid-stage cancer drug. If the FDA approves lucitanib, EOS will receive $65 million, and another $155 million for achieving certain milestones. EOS had already given the European and rest-of-world rights to Les Laboratoires Servier, and now Clovis could receive up to $470 million in milestones from Servier, not to mention royalties on lucitanib sales. Eventually. …Want to read more news? Click here for a free trial to The Health Care M&A Information Source and download the current issue today. Newcastle Investment Corp. (NYSE: NCT) agreed to pay $1.01 billion to acquire a 52-property portfolio of senior housing properties from affiliates of Holiday Retirement, owned by Fortress Investment Group. The portfolio includes communities in 24 states that have a “complementary footprint” to Newcastle’s existing portfolio. Each master lease includes 26 properties, has a 17-year term and first-year rent equal to 6.5% of the purchase price, with annual increases during the following three years of 4.5% and then up to 3.75%….Want to read more news? Click here for a free trial to The Health Care M&A Information Source and download the current issue today. TriVascular, Inc., a medical device company focused on patients with aortic disease, announced the close of a $40 million Series E preferred stock equity financing last week. Existing investors New Enterprise Associates, Delphi Ventures, MPM Capital, Kearny Venture Partners, Kaiser Permanente Ventures and the Redmile Group were joined by new investors Deerfield Management, Rock Springs Capital and Permal Asset Management. Proceeds will be used to expand commercial efforts of its Ovation and Ovation Prime platforms worldwide and to fuel product pipeline and clinical research activities…. Want to read more news? Click here for a free trial to The Health Care M&A Information Source and download the current issue today. Your free trial includes 2 monthly newsletter issues, weekly email alerts to the latest deals and developments in every key segment of the health care service and technology sectors, including behavioral health care, biotechnology, e-health, home health care, hospitals, laboratories, long-term care, managed care, medical devices, pharmaceuticals, physician medical groups, rehabilitation and more.Plus, you’ll receive a sample of the Health Care M&A Quartlery Report. Visit http://www.levinassociates.com/freetrialm to sign up now. As daunting as the constant changes in technology may appear, technological advances in the senior living/senior care sphere have been truly astonishing. Wireless communication has become ubiquitous, telehealth and telemedicine use has expanded, and non-invasive electronic sensors and warning systems keep seniors safe and healthy in their homes. The future of technology in the senior living/senior care environment, as presented by our panelists, is bound to be exciting…perhaps even amazing! Find out more from our expert panel. 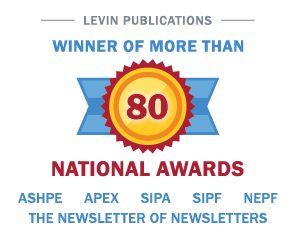 Go to www.levinassociates.com/conferences/1312-online-conference or call 800-248-1668 to register.